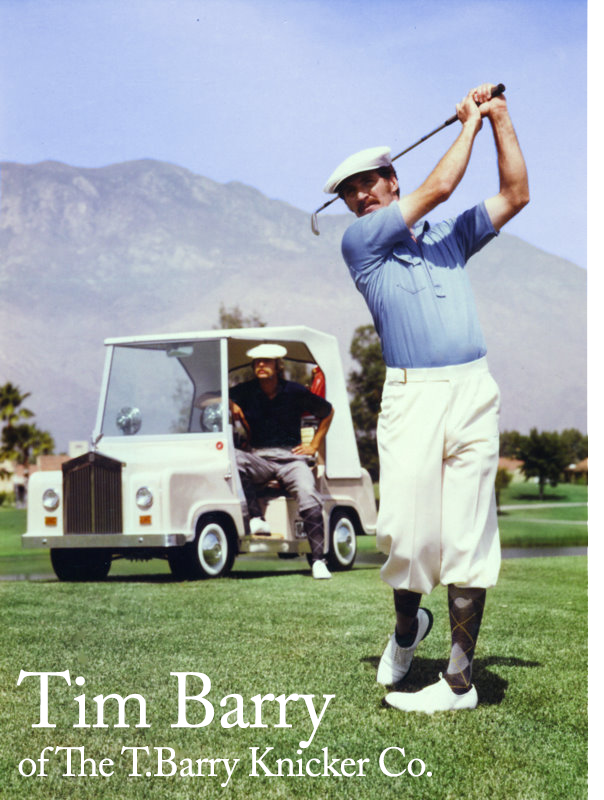 Founder & CEO of The T. Barry Knicker Co.
A native of Washington, Tim Barry started his "love affair" with golf, its history and its fashion at an early age. He swung his first golf club at age 10. At 14, Barry invented a board game called "Professional Golf," designed to help acquaint people with golf, its rules and its terminology. That same year, he found a set of knickers-a 1920s pair in a costume shop. He had a local seamstress take them apart and create a "pattern," then make him his first pair of "plus fours." He started wearing them to high school where he played on the golf team. Born in 1949, Barry attended Spokane Falls Junior College, Spokane, Wash., and the University of Houston, before deciding to make golf his full-time career. In 1968, with two other golfers, he went on an amateur golf tour, competing in Washington, Oregon, Idaho, Montana and Arizona. At the age of 19, Barry became an assistant golfing professional in Lewiston, Idaho. Then he learned about the famous teaching professional, Johnny Revolta, and, in 1972, moved to Palm Springs to work with Revolta. Within a few months, he turned golfing professional while working at the Palm Springs Mobile Country Club, Cathedral City, Calif. During the summer months, he played on the Canadian Golf Tour and what was then called the U.S. "Grapefruit Tour." Barry remained at Palm Springs Mobile club five years, working his way up to head professional. In 1977, he moved to the San Fernando Valley to become head professional at Braemar Country Club. In 1980, Barry returned to Palm Springs to become head professional and director of golf at Mission Hills Country Club, Rancho Mirage, Calif. That same year, he started a sideline business-making knickers for Mission Hills members. Barry was forced to move on in 1981 when Mission Hills changed ownership. He decided to pursue the knicker business. He made Bob Hope his first pair in 1981, and Payne Stewart's first pair in 1982. Other famous golfers Barry has outfitted with high quality, nostalgic "plus four" knickers have included Bob Toski, Marlene Floyd, Miller Barber and Billy Casper. Celebrities include: Phil Harris, Tip O'Neill, Mickey Rooney, Gerald Ford, Andy Williams, Glenn Campbell, Jack Lemmon, and Dinah Shore. Recently, Barry has shipped orders to Bruce Willis, Will Smith, Charlize Theron and Jane Seymour. T. Barry Knicker Co. has shipped its knickers and accessories all over America, as well as Canada, Japan, South Africa, the Bahamas, England, Scotland, Switzerland, Holland, and Puerto Rico.